The score is 5-4* in the first set with Kubot about to serve to stay in the set. I feel that's worth a punt at 1.25 so I've lumped on! Need the hold then Cilic then you've got a free game or a tiebreak! Uh oh ... 15-30 Don't stuff up Marin!! ... 30-30 ... 40-30 ... 6-5* Now for the break please! Hold to love! Tiebreak it is!! 0-2* C'mon get that MB back please! 1*-3 That's better now another. 1-4** Pfft that the TB all but gone! Can you at least get one MB? 1-5* Ace :-( Maybe the change of ends will bring about a change in fortunes? 1**-6 Woeful TB Rank 13 v Rank 111??? Well it's rank that's for sure! 3-6** Too little too late? Set Kubot. What an awful TB from Cilic! 5-3* Need to hold now! 5*-4 Now or never Lukasz! Will Cilic choke? If his TB in the first set is anything to go by he might! 15-30 ... can he do it? ... 30-30 ... 40-30 :-( ... SET Cilic! Two sets and I've been on the wrong side of both!! Still fancy Kubot to nick this so I guess my little green is on the right side! The problem is I don't like the liability so I'm going to have to look for opportunities to trade in this set! From 40-0 to Deuce is not the start I was hoping for! BP!!! Double Fault! 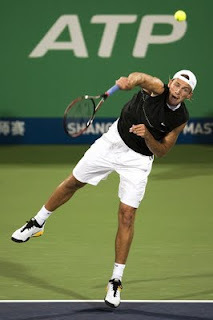 FFS Kubot what are you doing? AND BREAK :-( Bank is a goner it would seem!! Or maybe not! 0-30 can he actually do it this time? 30-30 No he can't :-( GP ... And Holds!! How many opportunities does Kubot want? So frustrating this especially as Cilic was so bad in that 1st set TB!! 3-1* Need to keep holding now!! Hmm 0-30 :-( ... 0-40 :-( ... 15-40 ... 30-40 ... Deuce! Now hold and lets see 1.02 smashed please!! GP ... Lucky git Cilic Deuce#2 ... BP pffft ... Break! 5-1* There's the hold! Let's put me out of my misery now then! May have the rest of the night off too.